If you live in the Northern Virginia area, please don’t read this article. Seriously, finding Four Roses Single Batch Bourbon (let alone their Single Barrel) is hard enough already. Of the four Virginia ABC liquor stores I visit in my area (and yes, there’s a connection between state-owned liquor stores and poor selection) only one carries Four Roses Small Batch. Just like how a different Virginia ABC store is the only one that carries my favorite rums: Zaya, Ron Zacapa, and El Dorado 15. Four Roses distillery in Lawrenceburg, Kentucky, makes a number of very nice bourbons, including their standard “Yellow Label” variety which sells for the bargain price of around $20 per fifth. Lately, however, my go-to has become the Small Batch, which offers more complexity for around $32 (sometimes less, if you can find it on sale). The Four Roses Small Batch is a blend of four different bourbons which average six and a half years of age, though they may be aged longer if master distiller Jim Rutledge deems it necessary. When all the blending is done the Small Batch is 90-proof (45% ABV). The amber-colored spirit has a lemon cake nose with citrus, vanilla, and burnt sugar. Dominant flavors are lemon and burnt sugar, with additional complexity provided by butter, orange peel, oak, and caramel notes. The finish is long and smooth with rye, caramel, and touches of pepper and pine. 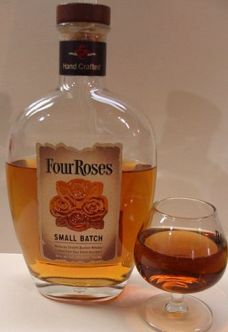 Four Roses Small Batch is a favorite of mine because it is both sweet and complex, whereas many overly sweet bourbons lose the heft and complexity in their sugary sweetness. The well-roundedness of this bourbon makes it an excellent pairing for medium-bodied smokes. Some of the best cigars to pair with this spirit include La Aurora Guillermo León, Arturo Fuente Añejo, Isla de Cuba Aged Maduro (sadly discontinued), and the Padrón (original series) natural. For something more full-bodied (and thicker) try the CroMagnon Mandible, which has plenty of sweetness from its oily Connecticut wrapper and Cameroon binder. Whatever your cigar pairing choice, I’m confident Four Roses Small Batch will impress you with its complexity and reasonable price. That’s why it’s become a staple in my collection. I just learned about Four Roses Bourbon on Twitter last week! Great to read a review of it, too. Thanks! The FR Small Batch is one of the best bourbons on the market. Period. The price point is just icing on the cake. Stack it up against bourbon 5x as expensive and it will hold its own.